Holy One of Blessing, we call You by many names. But You call us, in all the beautiful diversity You created, by only one name: human being. You have created each and every one of us in the Divine image, and when one of us has hurt another, we commit a crime, not only against another human being, but against You, and against your creation. We Jews have come through Shabbat Zachor this week, leading into our festival of Purim. Shabbat Zachor, the Sabbath of remembrance, is a time when we Jews recall some of the worst and most evil acts ever committed by human beings against other human beings. We are reminded in this Torah teaching to remember the acts of hate, and simultaneously, we are taught to blot them out from under heaven. What a bizarre combination – remember the inhumanity, and block it out – a seeming contradiction in terms. Though this tradition is rooted in the book of Deuteronomy, more than 2500 years old, it is clear that we still have so far to go when it comes to the violence and hate that human beings are capable of committing towards one another. We gather in this space to denounce the anti-Semitic acts committed here 11 days ago. And we gather in this space, too, to denounce the brutal act of white supremacy committed against Muslims in New Zealand. Thank you, God, for this day. Thank you for giving us the capacity to see clearly that, just as love is love is love, so, too, hate is hate is hate. 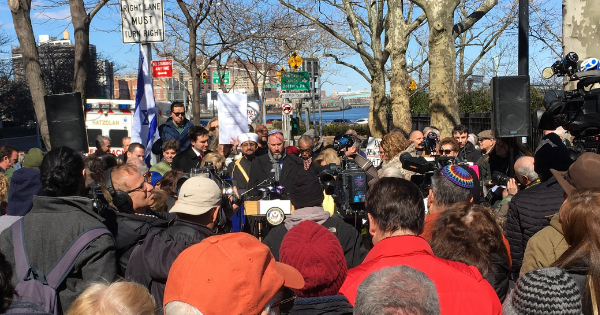 Hateful acts against Jews, against Muslims, against any of your creatures, cannot and will not stand, not here in New York, not here in this great country, not anywhere in Your world, so long as we stand strong and stand together. Thank you, God, for giving us the strength to stand against hate, to stand for love. I pray that we will have joyous occasions to gather sometime soon in Your holy name; why does it seem that, all too often, we only gather after tragedy? A few months ago, when 11 Jews were murdered in a Pittsburgh synagogue, Imam Jalloh of the Islamic Center of New York reached out to express his condolences to our community. This past Friday, I exchanged messages with the Imam expressing our condolences to his community. I said, “we have to stop doing this.” “Inshallah,” he replied. Holy Blessed One, we are blessed today, in spite of the hate we have witnessed. We are blessed to have public officials who, unlike so many Purims in Jewish history, have refused to stay silent when acts of anti-Semitism, acts of hate, acts of injustice have been done to communities of faith. We are blessed to have faith communities who, unlike so many Purims in Jewish history, stand with one another against those who would strive to instill fear in us, against those who would seek to divide and thereby conquer us. We are blessed to be New Yorkers who both remember the evil that humanity can unleash, and yet, by Your strength, O God, remain undaunted in our commitment to blot out evil. As we gather this day, O God, in the days between Shabbat Zachor and the festival of Purim, let us remember. Let us remember that you have created each of us with the spark of the Divine so that when we look at each other, we remember that we are looking at the face of God. Let us remember that, even as we mark with sadness today the Hamans that still threaten us, that we have the capacity to live in the tradition of Esther. Give us the courage to stand united against hate, to be willing to take risks to combat hate, to be ready to go before the king even if has not invited us in. what has divided us will merge. And then everywhere will be called Eden once again.